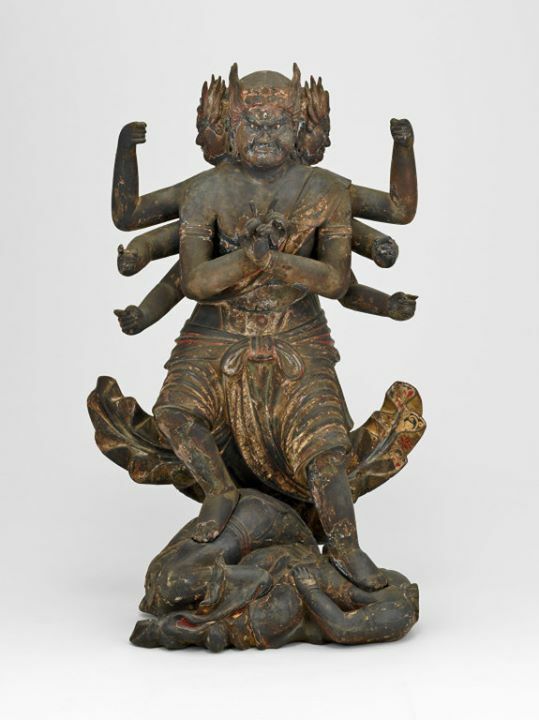 This sculpture depicts Gozanze Myo-o, a four-faced, multi-limb deity, trampling Daijizaiten and his consort, Uma, the gods of unruly human passion. The figure belonged to an ensemble of five sculptures arranged within the sanctuary of an Esoteric Buddhist temple. The group was known collectively as the Godai Myo-o (Five Great Lords of Light), and together the sculptures symbolize the rage against all threats to Buddhism and all obstacles to enlightenment. Such icons were introduced to Japan from China by the monk Kukai in the ninth century, and they were used in ceremonies to bless and protect the nation. In the Shingon tradition of Esoteric Buddhism, the Five Great Wisdom Kings (五大明王; Japanese: Godai Myo-o; Chinese: Wǔ Dà Míngwáng), also known as the Five Guardian Kings are a group of Wisdom Kings who represent the luminescent wisdom of the Buddha and protect the Five Wisdom Buddhas. This sculpture is of Trailokyavijaya (降三世明王, Japanese: Gozanze Myo-o; Chinese: Jiàngsānshì Míngwáng) "The Conqueror of The Three Planes" - Wrathful manifestation of Buddha Akshobhya.